Sorry for the long time between episodes, but in the interim, I became a father. Audrey Ruth was born Dec 15, and so I wanted to celebrate by featuring a song first made famous by another lovely Audrey. I skipped over many of the biggest versions of this song and went right for the most interesting (for the most part). i listened to this with dread last night, having not being able to make it through the henry mancini orchestral version a few days before. 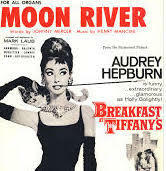 was this going to be two hours of henry mancini versions of moon river? yikes! instead, i was pleasantly surprised at how well the versions you covered played! i now know what a good version of 'moon river' sounds like. hearing the johnny mercer sung version was a treat. To be perfectly honest, I'm primarily a drummer who long ago taught himself to play guitar upside down (I'm a lefty but play a righty guitar upside down). So I have to ask my guitar playing friends to translate the chords I play.